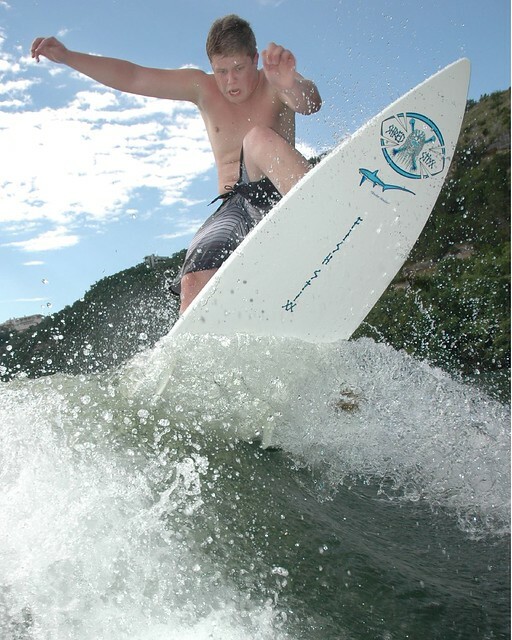 Some pics from a surf session on Saturday on Lake Austin. and for those who are curious about the ballast setup..
there was also a 750lb fat sac in the rear compartment and the stock ballast system was used as well. 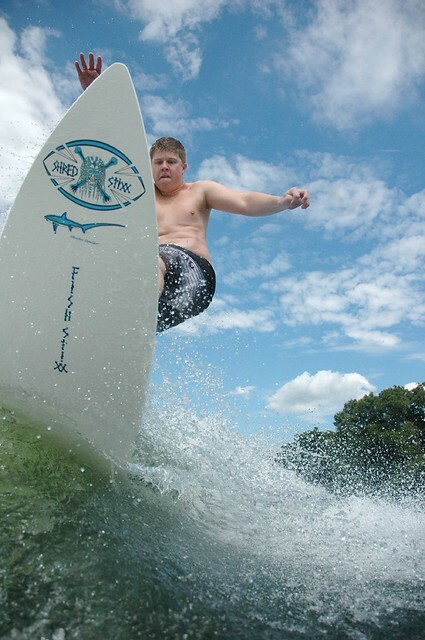 Cool pics... been thinking about one of those Wakesurf boards!!! thanks! surfing's fun.. but this board (which belongs to my buddy) is too squirrely for me. HOWEVER WHY NO LIFE JACKETS? ITS YOUR LIVES HOWEVER I WOULD NEVER GIVE SOMEONE A PULL WITHOUT A JACKET. NOBODYS WATER PROOF! I don't know many people who use a vest while surfing, neither behind a boat nor in the ocean. most of the people i know surf after a wakeboarding session, and don't want to feel claustrophobic in a vest. plus that day it was in the high 90's, and the water in that area was around 67 degrees, gotta enjoy the spray and breeze. So you have a 750 in the locker, two 750's in the middle and two 440's up front? Thats a hell of a lot of ballast. 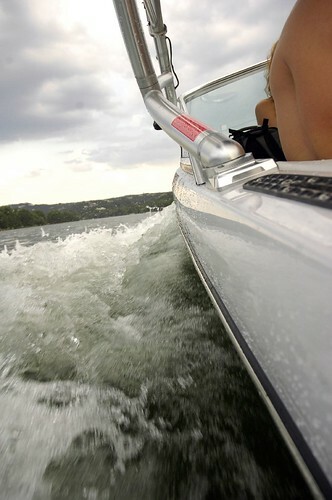 What model year nautique is that? Does it have the engine vent on the side of the boat in the rear? I have an 09 with the vent and I am already pretty close to the water line with just two 750's. Whats the secret? PKwakeboard, it's a 230, i think it's an 08. dunno the secret but you definitely can't turn right and you have to be careful about doubling back because it sits so low it will swamp really fast. Here is a picture of how it sits underway, but this was taken a few months ago before the other 750 was added on the floor. 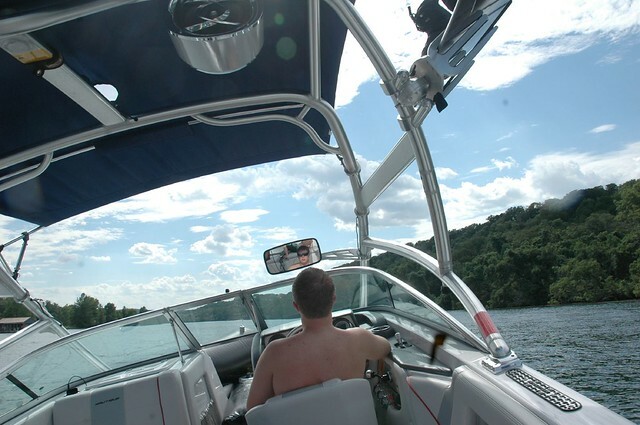 when we go out there's hardly anyone on the water. If you saw someone wearing a life vest while surfing on the ocean, you'd think he was a goof, even though ocean waves can pull you under. do you swim with a life vest on too? I agree, anytime me or my crew are in the water there is a pfd on. If we are floating we all at least put or legs through the jacket. You just never know, just putting my .02 cents in. Plus if the game warden stops u get ready for that ticket. 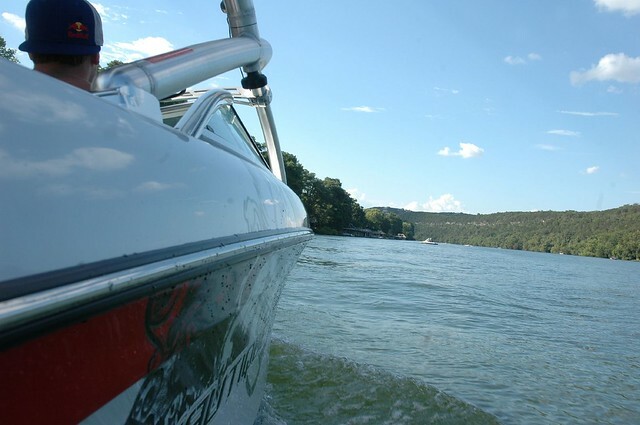 Plus if the game warden stops u get ready for that ticket. there was debate about that, i think they decided that it's technically illegal while the surfer is holding the rope but once he or she drops it it's ok. not too worried about being stopped during those 15-20 seconds it takes to get up and comfortable in the wave. I'm sure these guys know the risks, they're not stupid. there was debate about that, i think they decided that it's technically illegal while the surfer is holding the rope but once he or she drops it it's ok.
yeah. i'm sure they will still ticket people though. not my boat, not my surfing.. i was just the photographer. Would I wear a life vest while wake surfing? probably not. But you will rarely, if ever find me surfing behind a boat so it's more of a non-issue. I'm not disagreeing with you guys on the importance of a pfd, it's more that I don't have an opinion on these guys choosing to not wear one. I hear you. 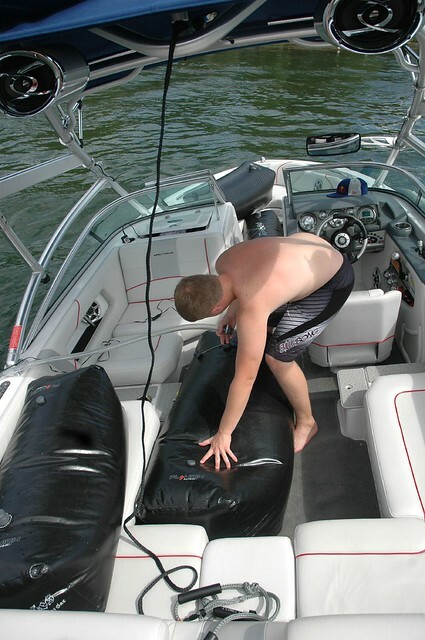 Just hate to know that a life could be lost, because a pfd wasn't comfortable. Its you and your buddys decision, but watch next time you are out surfing or taking pics you will be thinking about these post. Have fun surfing that nice wave.